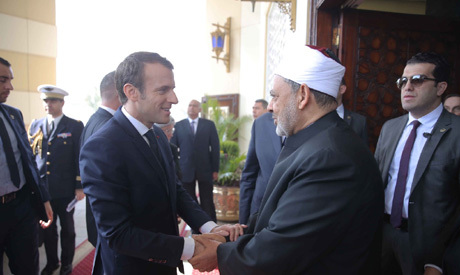 During a visit to Egypt's Al-Azhar Sheikhdom headquarters in Cairo on Tuesday, French President Emmanuel Macron told Al-Azhar’s Grand Imam Ahmed El-Tayyeb that France appreciates the institution’s role in combating extremist ideas. Macron’s visit to Al-Azhar wraps up his first official trip to Egypt, which started on Sunday with a stop at Aswan, where he visited Abu Simbel Temple. During the visit to Al-Azhar by Macron and his wife Brigitte, El-Tayyeb said that the French president's visit carries special significance given the historical relations between France and Al-Azhar. The grand imam of Al-Azhar – the world's oldest institute of Sunni Islamic learning – said that studies and visits to France by Al-Azhar scholars have helped them become symbols of thought and culture in Egypt, and that the French schools of thought are still the most influential among the institution’s scholars. El-Tayyeb also said that Al-Azhar is continuously working to build bridges of dialogue with the West and major religious institutions such as the Vatican, the World Council of Churches and the Archbishopric of Canterbury, referring to his expected participation in the UAE's Global Conference for Human Fraternity in February next year. The conference is held in cooperation with the Vatican to spread peace among the followers of different religions. 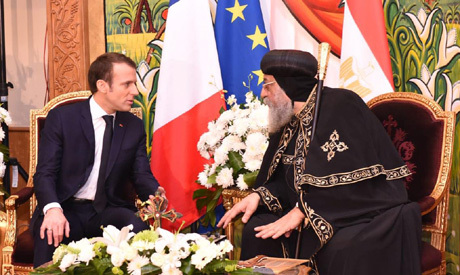 Earlier on Tuesday, Macron visited St Mark’s Coptic Orthodox Cathedral in Cairo's Abbasiya district and met with the head of the Coptic Orthodox Church Pope Tawadros II. On Monday, Egypt's President Abdel-Fattah El-Sisi and his wife received the French president and first lady at Cairo's Ittihadiya Presidential Palace. El-Sisi said that the Egyptian people alone can assess the political, economic and social rights they enjoy, and he highlighted Egypt's advancements in healthcare and social housing. Macron's first visit to Egypt comes amid unrest in France as a result of the so-called yellow vest protests, which have now reached 11 weeks of marches against Macron's economic reforms. The visit also marked the start of 'France-Egypt 2019,' which was launched earlier this year by El-Sisi and his French counterpart to commemorate the 150th anniversary of the opening of the Suez Canal. Egypt's President El-Sisi last visited Paris in October 2017, where he met with Macron and discussed joint efforts to combat terrorism, the Middle East peace process, the situation in Libya, and issues related to bilateral cooperation.